Sagamiko Resort Pleasure Forest: Fun, Thrills and Gorgeous Illuminations! 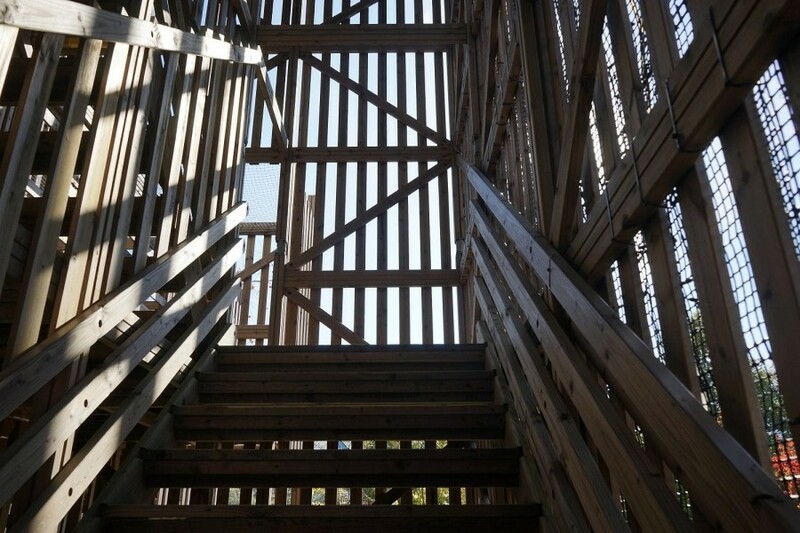 Sagamiko Resort Pleasure Forest is an amusement park located in Sagamihara, about an hour away from Tokyo. 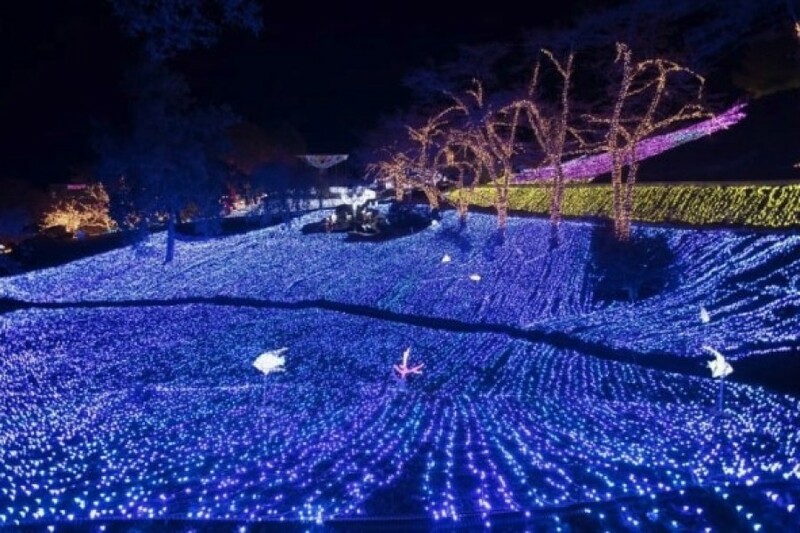 The venue of Sagamiko Illumillion, a famous illumination event, the Pleasure Forest can be enjoyed both at daytime and in the evening. If you're traveling with friends or with family, how about spending a day at one of the most exciting amusement parks in eastern Japan? 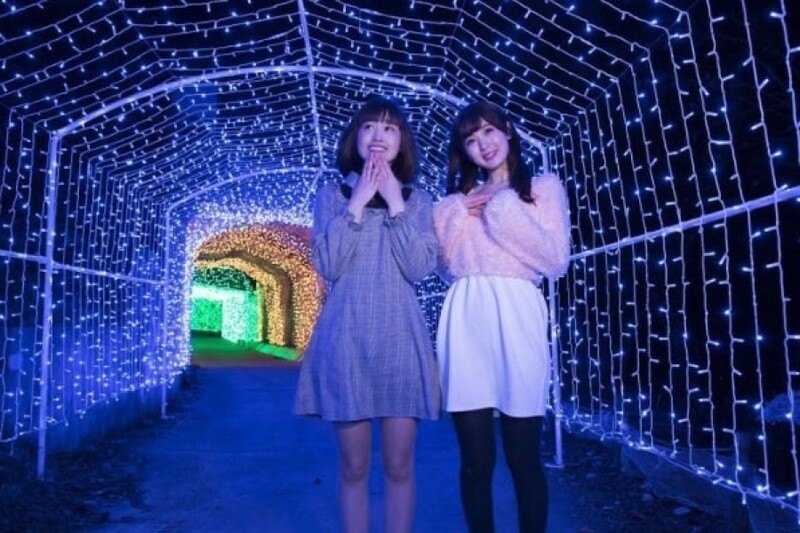 Sagamiko Resort Pleasure Forest, located in Sagamihara, Kanagawa Prefecture, is famous for its wide range of attractions that can be enjoyed by visitors of all ages, as well as for Sagamiko Illumillion, a large scale illumination event held yearly from November through the beginning of April. At Sagamiko Resort Pleasure Forest you can enjoy a day of fun outdoor activities while taking in the beauty of the natural surroundings in the area around Lake Sagami. The facility includes an onsen resort, where visitors can relax and unwind. And if you're visiting in the late autumn and winter months, you get to walk amid an impressive landscape of lights that stretches over the whole park. Introduced below are the highlights of Sagamiko Resort Pleasure Forest which can be enjoyed in one day. In order for you to make the most out of your time at Sagamiko Resort Pleasure Forest, it's recommended you depart from Tokyo around 8 AM. Sagamiko Station is on the JR Chuo Line, which connects it to major stations such as Tokyo Station and Shinjuku Station. Once you reach Sagamiko Station, head to the bus stop in front of the station. By taking the local bus heading to Mikage, which departs from platform No. 1, you'll be reaching Sagamiko Resort Pleasure Forest in about 8 minutes. If you intend to enjoy a whole day at the Pleasure Forest, please consider purchasing the free pass (3900 yen for adults, 3100 yen for children) which includes the entry fee and unlimited access to all the attractions in the park plus unlimited access to the illumination event Sagamiko Illumillion, with the exception of Muscle Monster and the Tengu Dojo playground. 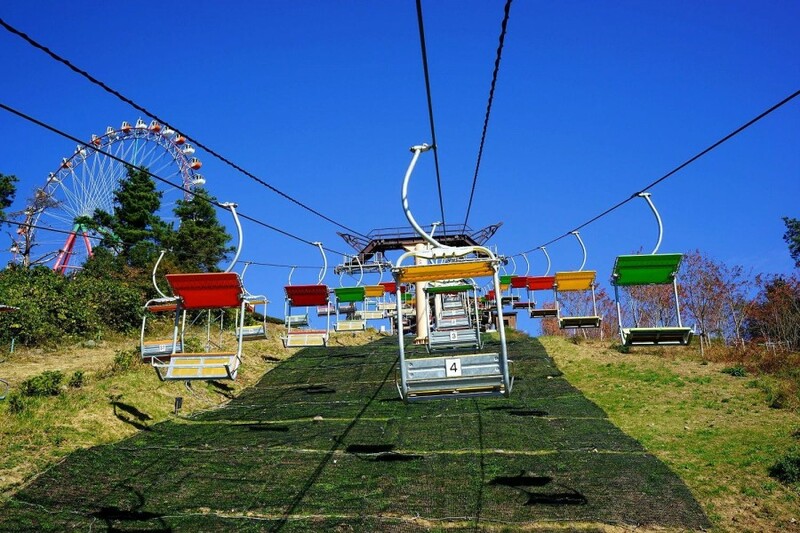 Sagamiko Resort Pleasure Forest stretches over a whole mountainside and consists of two main areas: the amusement park and the camping-barbecue area. The latter includes accommodation and camping facilities. 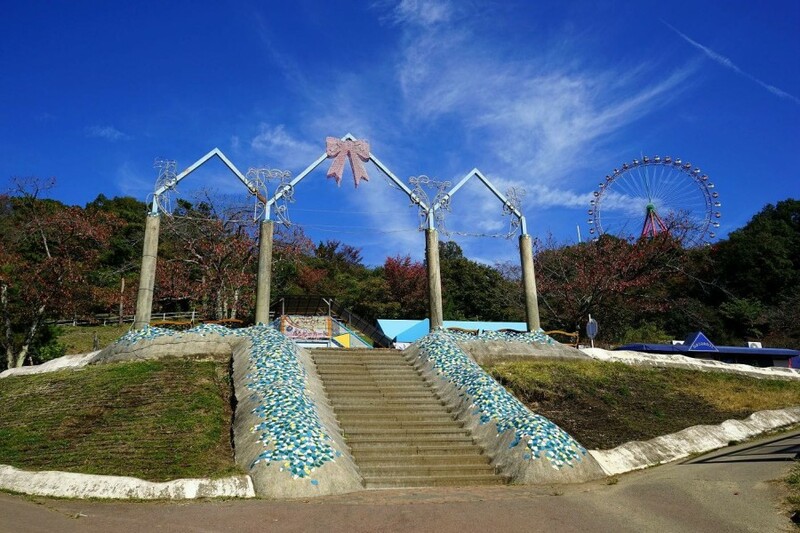 Nearest to the entrance of the amusement park is the area with play equipments for children. The kids can have fun playing with a wide range of objects that help develop their physical abilities. Closeby there are classic amusement park rides that can be enjoyed by adults and children alike such as a flying swing carousel, tea cups, a sky riding lane and even a kart racing ground. The Ferris wheel and other large attractions, including the scream machines, are located uphill. To go up the mountainside, you can use the chairlift which will transport you up the slope in minutes. It's a great chance to enjoy the ride and the view, as the surroundings are breathtakingly beautiful. With so many attractions and exciting rides, you may be at a loss not knowing what to start with. So let us introduce to you three amazing attractions that you can enjoy at the park. 1. The Ferris Wheel - See Lake Sagami and even as far as Tokyo! 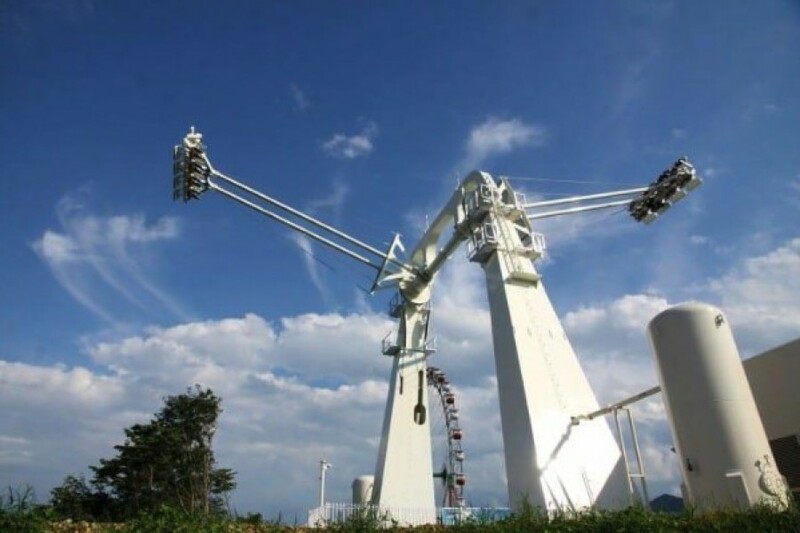 What makes the Ferris wheel at Sagamiko Resort Pleasure Forest so special is the fact that it allows an unobstructed view over the surroundings, a picturesque area with forest-covered mountains and the beautiful Lake Sagami. To the east, you can even see Tokyo in the distance. 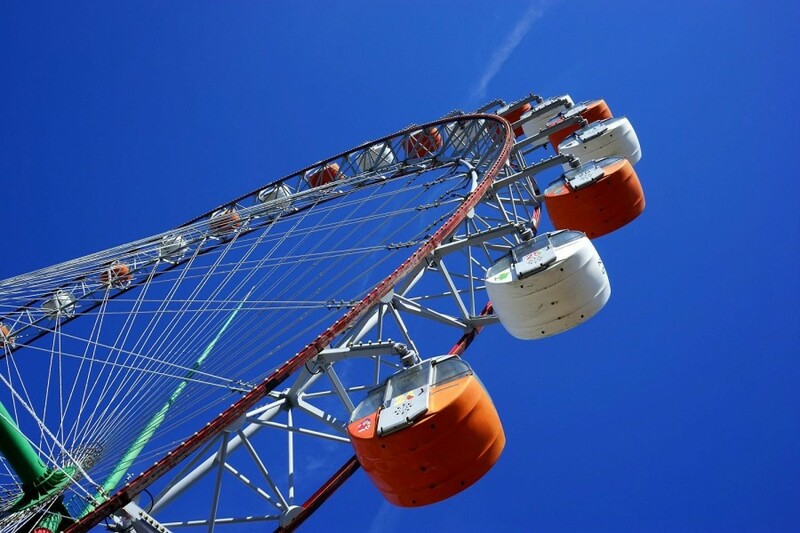 The ride on this Ferris wheel is a great chance to learn more about the geography of the place you're visiting, and maybe also to find a new destination to visit in the area. Those who seek the thrills of extreme rides should check out Oozora Tengoku ("Great Sky Heaven"). A large mechanical swing, this machine will fly you to the sky and back again. It might sound simple, but, trust us, you'll be dealing with a real scream machine. 3. The Three-Dimensional Maze - Find Your Way Out! The Three-Dimensional Maze is a fortress where you're challenged to find your way out through a complicated structure of corridors and stairs. While it can be enjoyed also by children, don't take it lightly! It may take at least 20 minutes to complete the course and reach the goal. Going up and down the stairs while looking for the way that's not a dead end makes for a great workout. Just remember to check for fake walls! Some of them might be doors leading you toward the goal. After enjoying some of the rides and attractions in the Pleasure Forest, you'll most surely feel hungry. 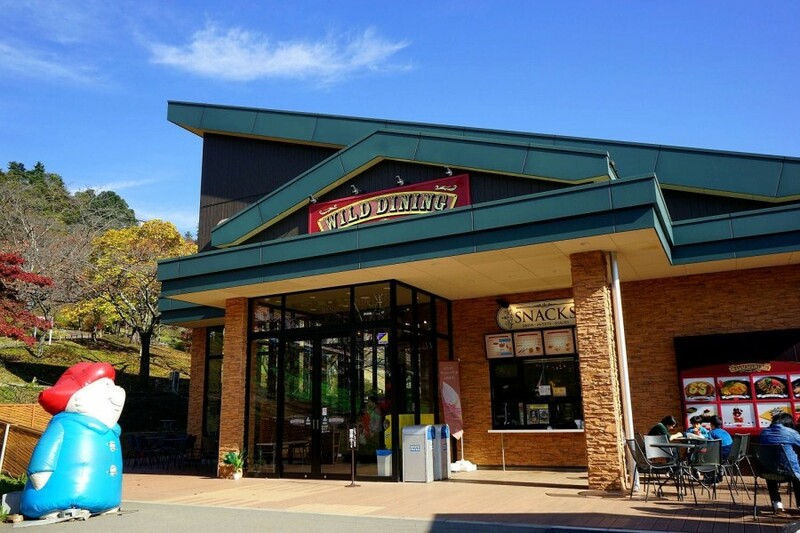 Wild Dining, located within the amusement park, is the place to go for lunch. 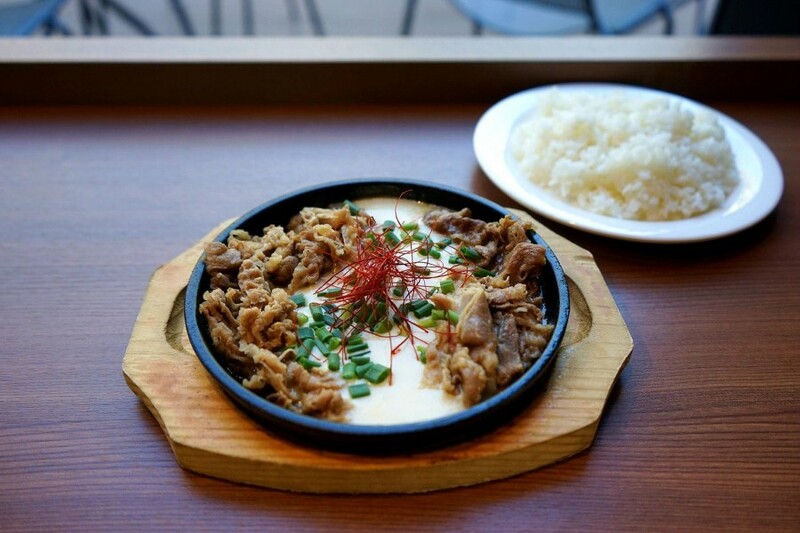 They offer a wide array of Japanese and Western dishes, from noodle or rice dishes to pizza and grilled specialties. You order by purchasing a meal ticket from the vending machine. After handing in your ticket to the staff, you wait for a few minutes and your set meal is ready. We tried the Teppanyaki Galbi Fondue (1100 yen), a tasty dish made with grilled beef ribs and melted cheese. It goes great with rice, giving you the stamina necessary for the afternoon. 13:30 - 15:00 -- Muscle Monster: The Ultimate Test of Your Physical Skills! 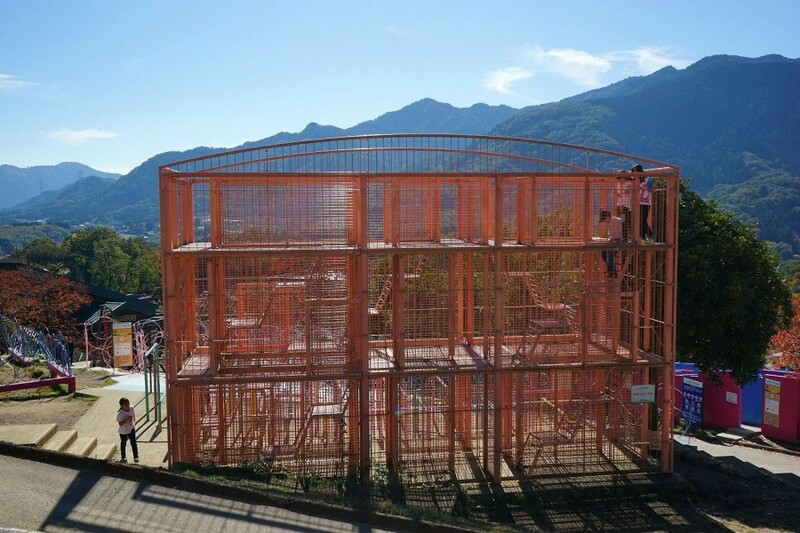 One of the most popular attractions at Sagamiko Resort Pleasure Forest is the Muscle Monster, a four-storied structure with countless equipments which will be a real test for your physical and athletic skills. 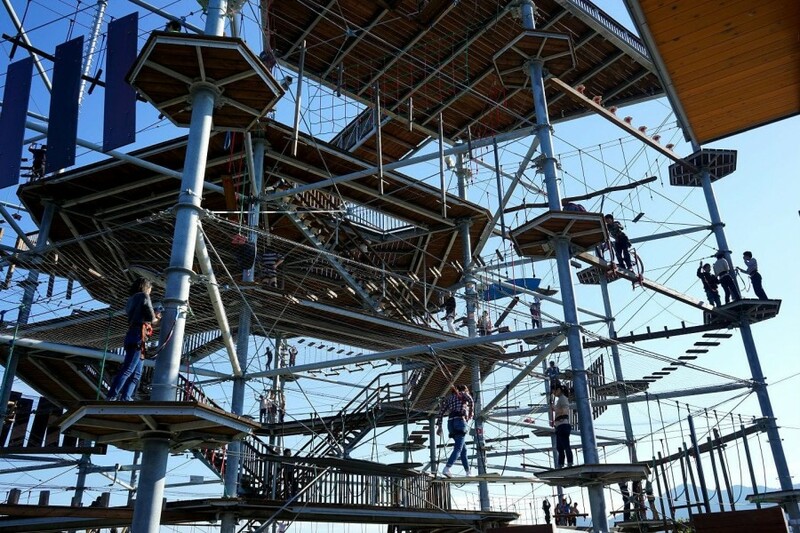 Before climbing on the Muscle Monster, all visitors need to take part in a 15-minute lecture on how to use the features of the safety harness. Listening carefully to the explanations of the staff is essential for everyone to stay safe while enjoying the thrills of the Muscle Monster. Because the explanations are given in Japanese, please make sure to ask a friend or a member of the staff to interpret for you in English. Explanations in English are also shown on a monitor so please make sure you read them through. What's so exciting about the Muscle Monster is that you'll be walking on a rope or moving objects, hanging in the air with only the rope of the safety harness and the power of your muscles keeping you from falling. It might be challenging but the moment you complete the course and reach the goal will be all the more rewarding. 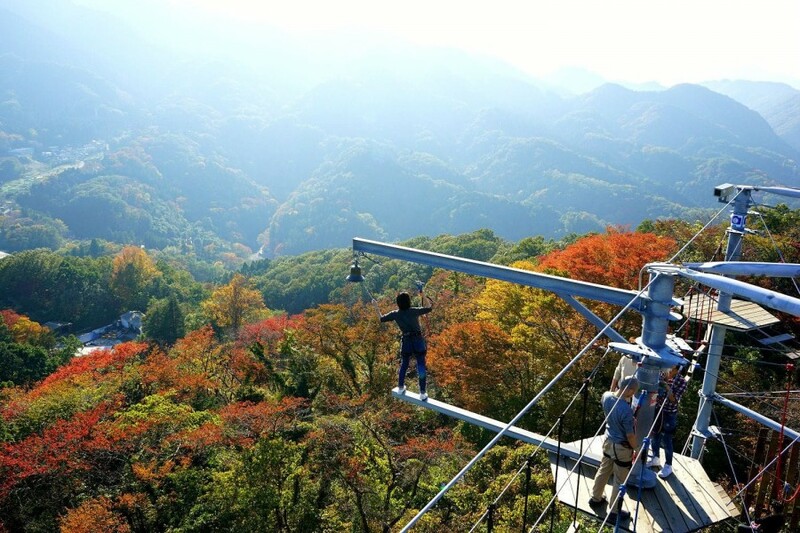 The successful challengers get to ring a bell while standing on the end point, suspended over the mountain landscape of Sagamihara. If you decide that the Muscle Monster is not for you, then take the stairs to the observatory on the top. 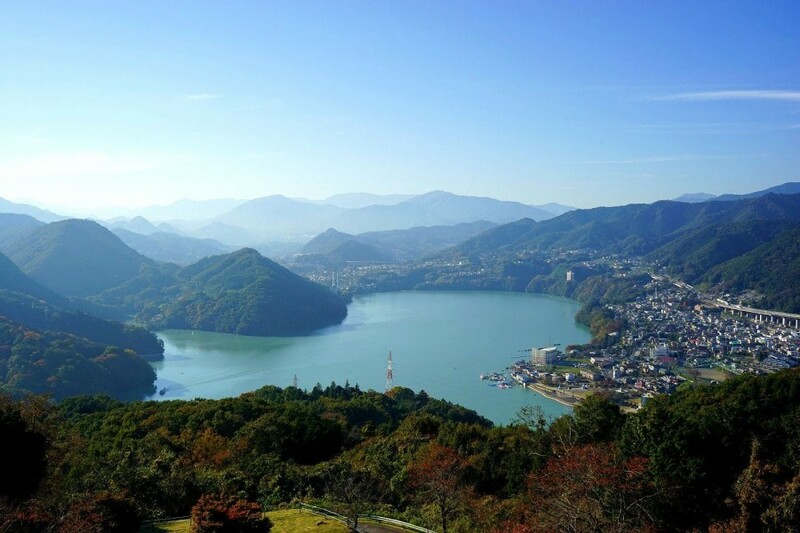 The view from above is unobstructed and stunningly beautiful, with Lake Sagami and the surrounding mountains to the west and Tokyo in the distance to the east. On clear days, you can even see Mt. Fuji from here! After a few hours of playing outside, there's nothing like a hot bath to relax and do away with the tension in your muscles. The onsen resort Ururi is located by the entrance to Sagamiko Pleasure Forest. Visitors can enjoy here a relaxing bath in the outdoor hot springs. You can also take a rest or get a massage and truly unwind. 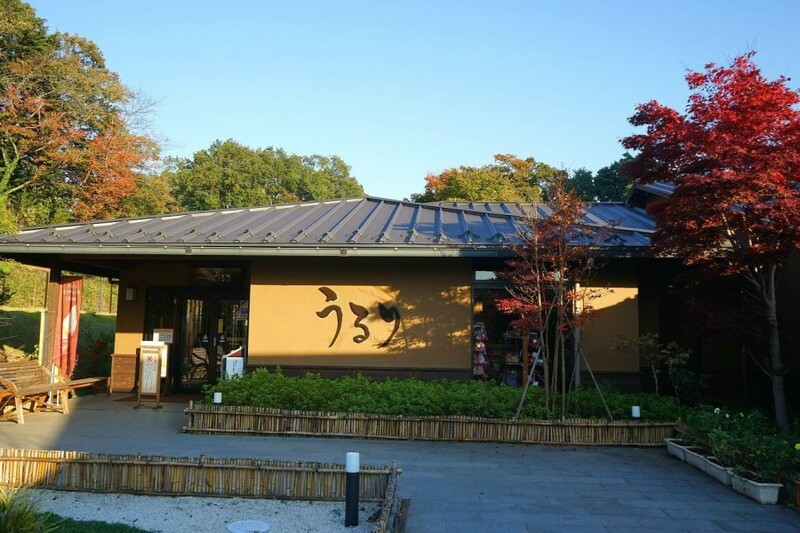 At the dining place of Ururi, you can enjoy tea time, coffee and snacks, and even light dishes. You'll love the warm, Japanese-style interior and the charming garden which can be seen from inside. 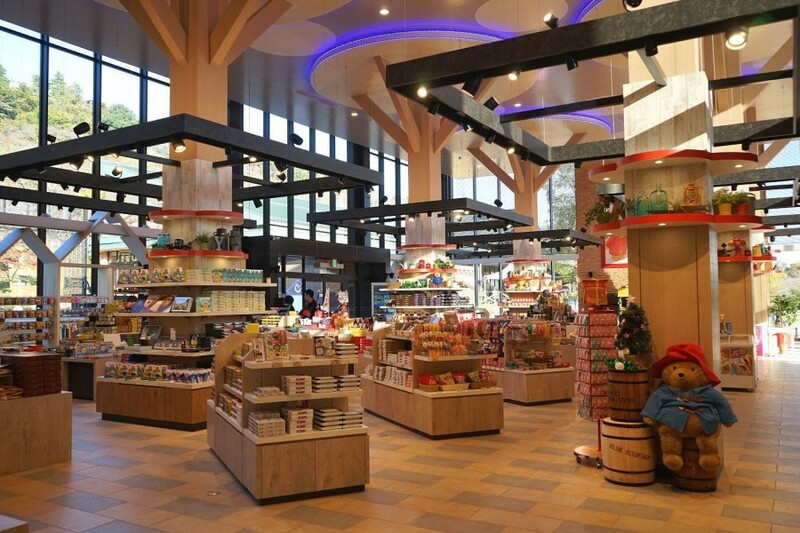 On your way back to the amusement park, you may want to check out the souvenirs available at the Sagamiko Resort Pleasure Forest shop. From sweets and snacks which you can bring home to your dear ones, to small objects to remember your visit by, there is a wide array of souvenirs you can choose from. 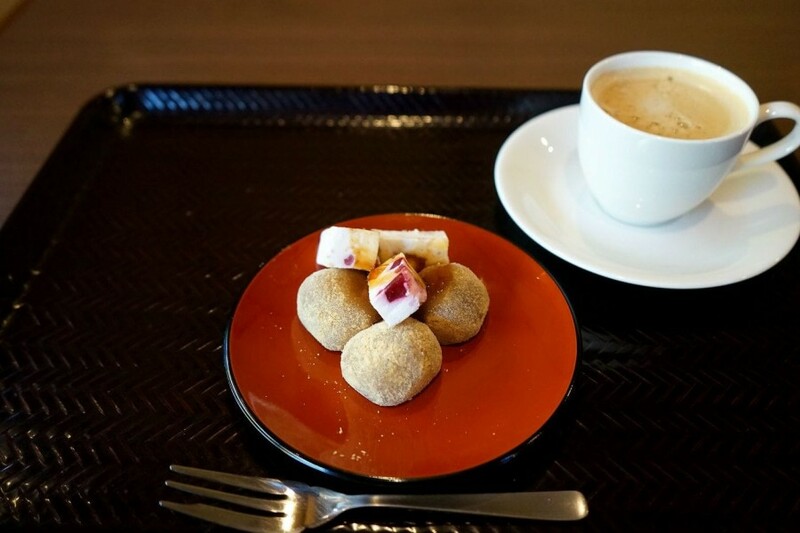 We especially recommend the sweets inspired by Sagamiko Illumillion. Not only do they have gorgeous designs, inspired by the beautiful winter lights, but they are a specialty of Sagamiko Resort Pleasure Forest. 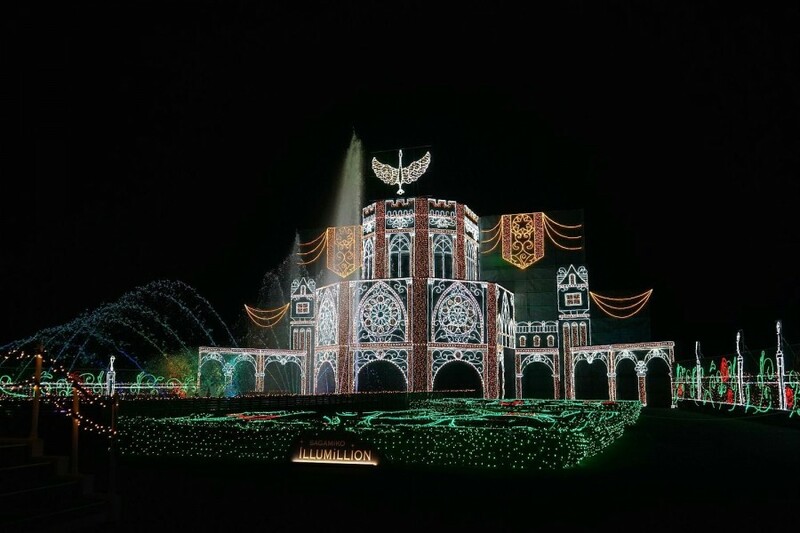 From 17:00 -- Enjoy the Fabulous Lights at Sagamiko Illumillion! Sagamiko Illumillion 2017 is being held between November 3rd, 2017, and April 8th, 2018. Renowned as one of the best illumination events in eastern Japan, Sagamiko Illumillion attracts thousands of visitors every year. From November to January, the lights go on at 17:00, so choose where you want to be at this time. Two recommended spots to witness the light up from are the area around the Ferris wheel, where there's a large, gorgeous Christmas tree that gets lit up instantly, or a gondola of the Ferris wheel! Seeing the whole Pleasure Forest lit up from above is amazing and we warmly recommend the ride just for the view! The major highlight of Illumillion is Hikari no kyuden ("The Castle of Light"), a breathtakingly beautiful installation whose lights change to the rhythm of music. The whole park is transfigured in the evening, with all the attractions being lit up and looking as if they were taken out from a storybook. It's a heartwarming atmosphere that you'll want to enjoy with your family or with your special someone. The Tunnel of Light and the Niagara Falls are other two amazing installations that create a world of light you wouldn't have imagined during the day. With Hikari no umi ("The Sea of Light") spreading before your eyes, you'll want to take a few moments and marvel at the creativity and ingenuity behind the art of winter illuminations. 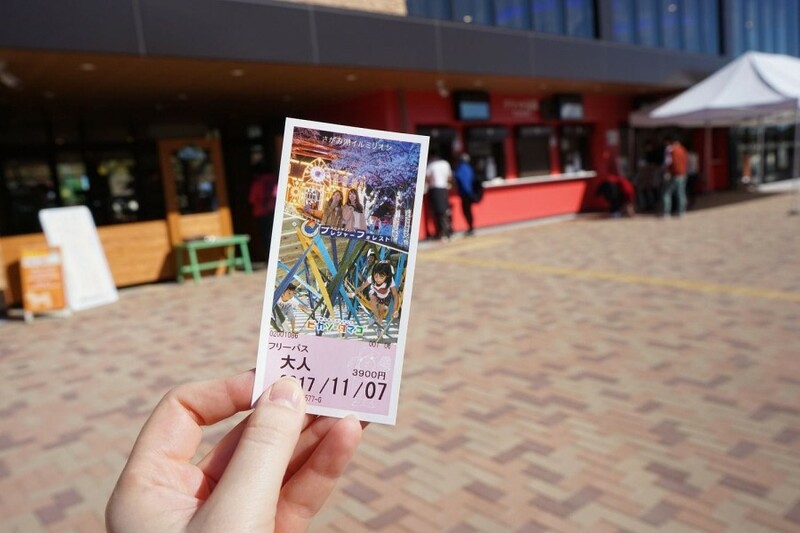 Experiencing the Sagamiko Resort Pleasure Forest both during the day and in the evening shows you two very different sides of this amazing amusement park. It is a very enjoyable location where you'll treasure every moment. 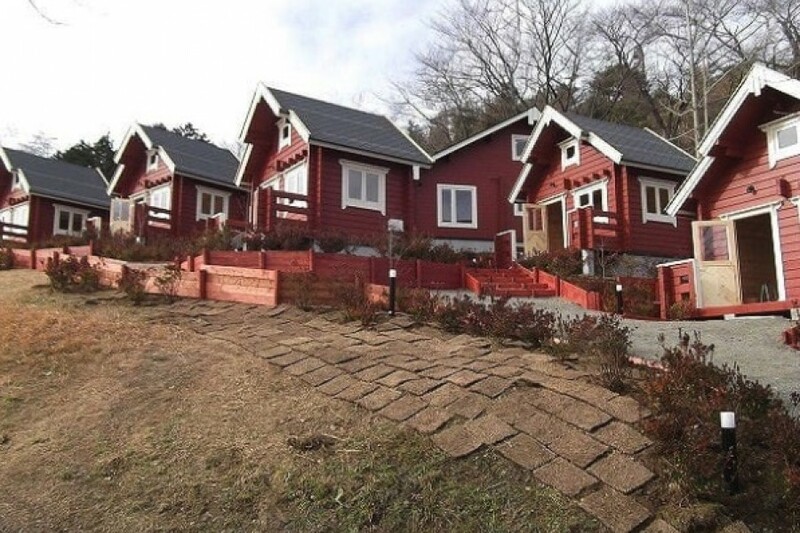 After enjoying the Illumillion, you can either go back to Tokyo or stay for the night at the Paddington Bear Camp Ground, the accommodation facility within the Sagamiko Resort Pleasure Forest. By choosing the latter you can enjoy one more day in the amusement park or go for a trip around Sagamihara and Lake Sagami. At the Paddington Bear Camp Ground, you can choose between staying in a cabin or in a caravan, which are fully equipped and comfortable. Please be aware that you should check in by 16:00 in order to be able to stay for the night. The check out time is before 10:00. No matter if you decide to spend one day or several days here, enjoy your time at Sagamiko Resort Pleasure Forest and take in the beauty of the surroundings.